Donald MacKinnon was born in 1839 in Kilchattan on the Argyllshire island of Colonsay. He was the first Professor of Celtic Languages, Literature, History, and Antiquities at the University of Edinburgh, and he made substantial contributions to every one of the fields listed in his title. MacKinnon occupied the chair from 1882 until he retired in summer 1914. He died a few months afterwards, on Christmas morning, at his home at Balnahard in his native island. As a student at Edinburgh, MacKinnon enjoyed a dazzling career crowned in 1869 by the Hamilton Fellowship in Mental Philosophy, a grant of £100 allowing him three years’ further study at the university. Ironically, it was the Education Act (Scotland) of 1872, that ruthless destroyer of Gaelic schools, which was to give him his big break. After the Act was passed, Donald MacKinnon was appointed as the first Clerk and Treasurer of the School Board of Edinburgh. Admirers of Donald MacKinnon – and, it has to be said, on occasion Donald MacKinnon himself – have made much of his humble beginnings, but we should remember that talent often attracts sponsors. MacKinnon was fortunate to have caught the attention of two of the most influential figures in Scotland, men who just happened to be from Colonsay like himself. Advocate and judge Duncan McNeill, first Baron Colonsay (1793–1874), was the pre-eminent Scots lawyer of his time; while his younger brother Sir John McNeill (1795–1883), chairman of the Board of Supervision in charge of the operation of the Poor Law (Scotland) Act, was the most powerful civil servant in the country. Long before the Edinburgh Chair of Celtic was finally established in 1882, MacKinnon’s patrons were unobtrusively promoting the merits of their candidate. MacKinnon was certainly an ideal contender for the professorship: an excellent Gaelic prose stylist, an industrious contributor of columns to newspapers and periodicals, a man who participated to the full in the lively Gaelic-speaking community in the capital – and who would soon undertake arduous service on the parliamentary Napier Commission travelling around the Highlands enquiring into crofters’ and cottars’ rights. MacKinnon was also a popular teacher of a generation of Gaelic students, including the first women Celtic scholars in Scotland. In particular, as the pioneer Celtic Professor in Scotland, Donald MacKinnon had to lead the way and lay the foundations for future scholarly study of Scottish Gaelic. This he did with aplomb. His lectures defined and delineated Gaelic literature and history, as well as elucidating Gaelic place-names and personal names. His Gaelic Reading Books laid down a syllabus for elementary and advanced students in the language. Most enduringly, his Descriptive Catalogue of Gaelic Manuscripts in the Advocates’ Library, Edinburgh, and Elsewhere in Scotland(Edinburgh: T. & A. Constable, 1912), the fruits of five years of research generously sponsored by John Crichton-Stuart, fourth Marquess of Bute (1881–1947), remains a crucial work of reference for both classical and vernacular Gaelic manuscripts in Scotland – including four then in MacKinnon’s own possession – more than a century after its publication. But, as the new online library catalogue to Professor Donald MacKinnon’s collection demonstrates, he should also be remembered as a great collector of books, Gaelic and Celtic. In making MacKinnon the Typographia’s dedicatee, Maclean pays tribute to the professor’s assistance and encouragement – and to the breadth and scope of his Gaelic library. MacKinnon’s collection had already been at the heart of a major Gaelic books presentation, one of the attractions, along with quaichs, silverware, tartans, and regimental uniforms and colours, shown in the Highlands and Islands display in the Fine Art Galleries at the great Scottish National Exhibition in Saughton Park between May and September 1908. During this time of the Scottish Celtic Revival, Gaelic culture, sports, and costumes loomed large in the Exhibition programme, alongside the helter-skelter tower, the switchback railway, the water chute, the Irish cottages, the Senegal village, the display of baby incubators, and diverse other attractions intended to educate, entertain, and astonish. • a very rare copy of the Apocrypha translated into Scottish Gaelic for Prince Lucien Bonaparte by the Rev. Alexander MacGregor in 1860. • the blind poet Allan MacDougall’s song collection Orain Ghaidhealach of 1798. Now, not all of the major works listed above are found in the MacKinnon Collection today. This raises the possibility that the professor’s books arrived at Edinburgh University Library in two tranches. Whether during his later years as professor, or after his retiral, Donald MacKinnon may have donated to the Celtic Departmental Library at Edinburgh the canonical works of Gaelic literature on which his courses were principally based, works such as those mentioned above. 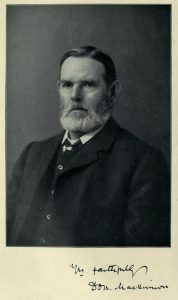 His personal library, on the other hand, was bequeathed to his friend and fellow islander Dr Roger McNeill (1853–1924), Medical Officer for Argyllshire, a man whose remarkable research and tireless campaigning was instrumental in founding the Highlands and Islands Medical Service in 1913, one of the main forerunners of our National Health Service today. After McNeill’s death, MacKinnon’s volumes, probably augmented by those from the doctor’s own collection, were bequeathed to Edinburgh University Library. It would be an interesting and useful exercise to see how far we can relate the books in the MacKinnon Collection, and others in the university collections probably once owned by Donald MacKinnon, with the listings in Maclean’s Typographia. In Professor Donald MacKinnon we have a scholar signal for the range of his interests and expertise even in an era noted for polymaths, a man celebrated by his colleagues and students, and remembered today for a number of crucial works of scholarship and reference. The MacKinnon Collection is one of the professor’s greatest legacies, allowing us to gain a clearer picture of one of Scottish Gaeldom’s most eminent scholars, and also, through him, a deeper understanding of Gaelic culture itself. This entry was posted in 19th Century, Rare Books, Uncategorized and tagged Book collecting, Crofters, gaelic, Highlands, Professor of Celtic, Scotland by elawrence. Bookmark the permalink. Artaigil air leth inntinneach a chòrd rium gu mòr. This is a most insightful article on Donald MacKinnon’s love of books and, as pointed out, a scholar in the best tradition of polymathy of that era alongside, inter alios, his fellow Edinburgh professor and distinguished classicist, pro-Gaelic activist, John Stuart Blackie. As a relation of my own through my Colonsay-born great-grandfather – Hector Bell – I was most interested in this account and, of course, his native island of Colonsay today boasts the publishing house – House of Lochar – which is surely a fitting link to his bibliophily. Duncan Ferguson, native of Islay; emeritus Rector, Plockton High School; fan of Gaelic scholarship and bit of a bibliophile – it must be in the genes!